29 Sivan 5770 – June 11, 2010. We graciously thank the Yated Ne’eman for granting us permission to post this article here. 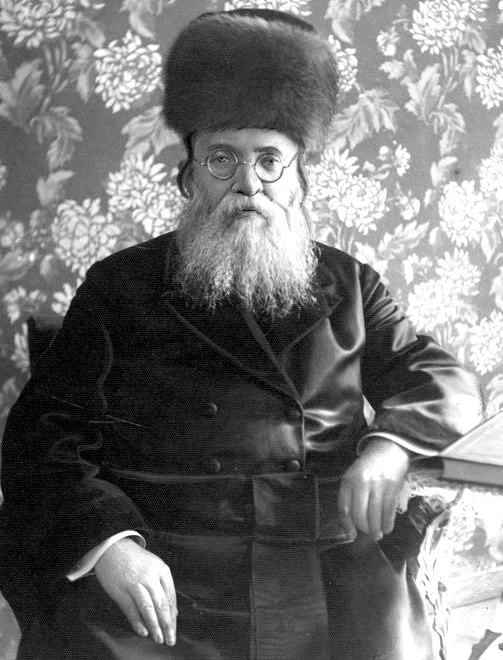 Rav Aharon Lewin, known throughout the pre-war Jewish world as the Reisha Rov was an absolutely unique personality, among the Rabbinic giants that comprised pre-Holocaust Poland. He synthesized a combination of piety, talent and wide-ranging activity rarely seen in one person. He was a gaon in Torah — his knowledge of all aspects of Torah, halacha, mussar and drush was phenomenal; he was a remarkable philosopher whose speeches were not only delivered with tremendous oratorical flourish but also contained within them gems of brilliance and deep thought; he was a leader of people; and the extent of his askanus and shtadlanus on behalf of the community and the individual was breathtaking in its scope. As we enter the 70th year since his death al kiddush Hashem at the hands of the Nazis, we remember this synthesis of a giant of Torah, chochmah and public service that no longer exists in our times. Rav Aharon Lewin was born on 14 Elul, 5640 (1879) in the Galician city of Pshemishel. His parents, Rav Nosson and Rebbetzin Hadassah Lewin, were the son-in-law and daughter of the Rov of Pshemishel and then Lemberg, Rav Yitzchok Shmelkes, author of the famed Sheilos U’Teshuvos Bais Yitzchok. As a young boy, Aharon spent much time with his grandfather, Rav Yitzchok Shmelkes. The Bais Yitzchok invested his heart and soul into the chinuch of his grandson and even from a very young age, it was evident that young Aharon possessed tremendous intellect and insight. Both his father and grandfather taught him Torah and by the time he became a bar mitzvah, it was clear that a new star was beginning to shine on the horizon of Poland’s rabbinical world. In the Machzikei Hadaas newspaper published in Poland in the month of Cheshvan, 5653 (1892), there is a paraphrased report about the remarkable bar mitzvah of the young bochur, Aharon Lewin: “Last week, the bar mitzvah of the wonderful, brilliant and erudite bochur, Aharon Lewin, grandson of the great Rov, Rav Yitzchok Shmelkes, was held. On Shabbos, the bar mitzvah bochur gave a beautiful drasha in the city’s main shul. The drasha was a masterful presentation of pilpul and sevorah — the boy posed a clear delivery and his words of aggadah were listened to raptly by the entire shul which was packed from one end to the other. All of the distinguished members of the community came to hear the young boy’s drasha. They all seemed amazed over the fact that such a young bochur spoke with such confidence before such a large crowd. After the drasha, the entire community converged to wish him mazal tov and express their deep feelings that he continue to benefit Jewry with his special gifts of Torah and chochma.” Indeed, it seemed as if the heartfelt brachos of so many Jews were fulfilled in the boy because after his bar mitzvah over the course of a few years, the young bochur began to develop and mature into a true gaon. He was soon considered among the most erudite talmidim of his illustrious grandfather. In the third volume of the sefer Bais Yitzchok (published in 1894), we find chiddushim in the name of the young 15 year old Aharon Lewin. He also completed the Maftechos – indexes for the sefer. The last two volumes of Bais Yitzchok contain many chiddushim from Rav Aharon, all written when he was a bochur. When he was in his late teens, Rav Aharon Lewin was already assisting his grandfather in many areas of the rabbinate of the city of Lemberg (Lvov) where Rav Yitzchok had since moved to from Pshemishel. Lemberg (Lvov) was the capital of Galicia and all of the most difficult halachic and communal matters arrived at the door of Rav Yitzchok who was one of the gedolei hador. He would discuss most of these matters with his young grandson and through these conversations, Rav Aharon absorbed the appropriate rabbinical approach to a whole host of halachic and communal matters. Even as a bochur, his talent as a public speaker was public knowledge. Once, when he was 19 years old, he gave a drasha at the “Koveia Ittim L’Torah” Shul. His drasha was so powerful and made such a profound impact on his listeners that they begged him to publish it so that others could also benefit from it. Thus the sefer “Dovor B ‘Ito” was printed in 1899, containing that seminal drasha. Once, when both he and his grandfather, the Bais Yitzchok delivered drashos one after the other in the main shul in Lvov, the Bais Yitzchok asked one of the prominent members of his kehillah for his opinion of his grandson’s speech. The man replied, “I will respond with the words of the possuk (Shmuel 1:18-7) Hikah Shaul b’alufav v ‘Dovid birivivosov—Shaul has slain his thousands and Dovid, his tens of thousands.” The Bais Yitzchok laughed and took great pride in the comment. While he was growing in Torah and learning with great hasmodah with his grandfather, Rav Yitzchok gave his consent to Rav Aharon taking the time to learn the two secular languages most prevalent in that area, Polish and German. He became completely fluent in both languages and spoke them with the fluency of his mother tongue. He began to write articles in Polish. His expert knowledge of both languages would eventually serve as an instrumental tool in his being able to improve the lot of his Jewish brethren. In 1902, Rav Aharon married Dobbah, daughter of Rav Eliyahu Tzvi Friedman from the town of Vielitchka near Krakow. Rebbetzin Dobbah Lewin represented the grace, tznius and middos tovos of a bas Yisroel. Throughout their nearly 40 years of marriage, she stood by her husband’s side with great fortitude, wisdom and purity. The Lewins established a wonderful family, a daughter, Preva followed by three sons –Yitzchok Lewin and the twins, Shmuel Dovid and Mordechai Lewin. Before his wedding, Rav Ahron’s grandfather, the Bais Yitzchok, wrote him an enthusiastic semicha document. It began, “Although it is well known that a father, by virtue of his closeness, cannot give testimony on his own son and this grandson of mine is like a dear son to me whom I raised, nevertheless, something that is well known to all does not require testimony.” The Bais Yitzchok continued to extol the virtues and scholarship of his grandson “who is destined to illuminate the rabbinic world”. Rav Aharon also received semicha from Rav Chaim Aryeh Horowitz, Av Bais Din of Krakow and Rav Binyomin Aryeh Weiss, Av Bais din of the city of Chernowitz. In 1904, Rav Aharon, a yungerman of 24, was chosen to serve as Rov of the Galician city of Sambor. The appointment of the young grandson of the Bais Yitzchok to lead a very, large city of thousands was the talk of Galicia. Such a young Rov for such a large kehillah was simply unheard of. At the time, Sambor was the home of the Chassidic Court of Rav Uri of Sambor to whom thousands of Chassidim from all over Galicia would flock regularly. The Rosh Bais Din of Sambor, Rav Itche Trow, was a gadol ba’Torah many decades Rav Aharon’s senior. Still, the young Rov was able to earn the respect of both the lamdanim who recognized his greatness in Torah and the Rebbe and Chassidim, who found in him a kindred spirit. As for the general populace, they found in him a Rov who was willing to petition for their rights, and cared about both their material and spiritual needs. In his first drasha in Sambor subsequently published in the sefer “Mateh Aharon” he elucidates his outlook of what he felt was the task of a kehilla’s Rov. He said that a Rov must first see to it that the material needs of his kehillah would be met, that the chinuch requirements of the youth are his highest priority as well as the Torah learning of the rest of the community. A Rov must be there to rule on all difficult halachic matters and must also symbolize the middos of Aharon Hakohein to ensure that peace and love exist between all of the varied groups that comprise the kehillah. This template of rabbonus was the one which he followed in his close to three decades in the rabbinate. He would often say that a Roy can-not serve for part of the day. True rabbonus is a 24 hour per day job! The young Rov was intimately involved in all kehillah matters. He was the primary force in addressing all community issues. Despite the considerable time he spent involved in shepherding his kehilla and askanus, he made sure to maintain a rigorous learning schedule. His early years in Sambor proved to be some of his most fruitful years of Torah accomplishment. During the first 8 years in Sambor, he prepared and published his large work on Meseches Brachos entitled “Birchas Aharon” which caused a tremendous stir in the Torah world. About one year before the Outbreak of World War 1 (1913), Rav Lewin was appointed by the Emperor of Austria as official “Advisor to the Emperor.” Although this was primarily an honorary title with no specific duties attached to it, it was nevertheless, the first time that a strictly observant Rov merited such an honor. In truth, however, the title became much more than honorific with the outbreak of World War I and the subsequent, resultant upheavals caused to Galician Jewry. The Russian Army conquered Galicia, forcing the Jews to flee westward. Tens of thousands of refugees fled to Vienna and other cities in Austria and Moravia. They came with barely the shirts on their backs and suffered great poverty and deprivation. The refugees were in dire need of a strong, able advocate to present their case before governmental leaders and agencies. They found that person in Rav Aharon Lewin, who had also fled to Vienna. With his title “Special Advisor to the Emperor”, he was eminently fit for the task and thus gained the trust and acceptance of the government to serve the needs of the refugee Jews. The government asked Rav Lewin to undertake overseeing all issues related to the refugees. With tremendous energy and personal sacrifice, the Sambor Rov ensured that they all had proper housing, shuls were established and shochtim were appointed to serve them. Another of his important accomplishments was the fact that he interacted with the government to ensure that all rabbonim would be exempted from army service. As soon as the Russians were pushed out of Sambor, Rav Lewin returned to his beloved community and began the task of rebuilding. In the aftermath of World War I, Poland became an independent country. At that time, Rav Aharon Lewin entered a whole new arena in avodas haklal that would propel him into one of the leading rabbis in the entire Polish rabbinate. With his wide ranging command of the Polish language, he was constantly representing the Jewish People before the government. In 1920, a delegate of three leading members of the Warsaw community came to Sambor to invite Rav Lewin to assume the position of Chief Rabbi of Warsaw, the capital city and the largest city in Poland. Ultimately, this idea did not come to fruition due to the fact that the Polish laws did not permit the appointment of a Chief Rabbi. In 1922, when, for the first time Sambor participated in the elections for the new independent country of Poland, the Jews of Sambor and some 20 surrounding cities, begged Rav Aharon to be their representative in the Polish Sejm — Parliament. He was nominated as a representative of the Jewish bloc and was elected with an overwhelming majority. Although Rav Lewin became one of the Sejm members affiliated with Agudas Yisroel, he truly represented every Jew, regardless of affiliation and served as a most able advocate before the Polish government, for both communal institutions and individuals. He was instrumental in trying to get the Polish government to help fund Jewish schools similar to the way they supported Polish and Catholic schools. His oratorical abilities made a profound impression on the entire government body. When Rav Lewin, in his dignified rabbinic garb and bearing would rise and speak with impeccable, eloquent Polish, he was able to petition the government in the name of equality, the law and ethical values on behalf of his downtrodden brethren. One of his most famous speeches in the Polish Parliament was his masterful address calling for the annulment of the death penalty in Poland. Elegantly and eloquently, he cited the view of the Gemara with regard to capital punishment and how sparingly it should be used, if at all. Once he joined the Sejm, his weekly schedule demanded that he stay every Tuesday, Wednesday and Thursday in the capital city of Warsaw representing his fellow Jews in Parliament. Sambor was a 15 hour train ride from Warsaw. Thus, every Monday afternoon, he would board the train for the long ride and every Thursday evening, he would return. On 5 Elul, 1926, Rav Aharon’s father, Rav Nosson Lewin passed away. Rav Nosson had served as the Rov of Reisha (Rszeszow) since 1904 and during the shiva, a delegation’ from the Reisha, community came to Rav Aharon to offer that he assume his father’s prestigious post. Rav Aharon replied that he could not give an answer until he knew if the members of the community truly wanted him. He asked that the kehillah declare that anyone who wished for the Sambor Rov to assume the position of Reisha Rov should come to the kehillah headquarters and sign a petition. In a matter of weeks, thousands had come to sign. Rav Lewin could not dispute those claims and agreed to accept the position provided that the election should be held by vote of every member of the kehillah and not just the community leaders. On 26 Adar, 1927, Rav Aharon Lewin moved to Reisha. He served the Jewish People from his base in Reisha for the next 13 years. Although the Reisha Rov was beloved by the members of his kehillah, there were certainly times that he felt compelled to use the full power of his position to make sure that problematic halachic and hashkafic innovations were not instituted in the community. Even when his uncompromising stance earned him enemies, he did not hesitate to utilize the utmost force of his power to ensure adherence to Torah in the public arena. In 1931, Rav Lewin was once again elected to the Polish Sejm and, for the next number of years he was one of the most influential rabbonim in the entire Poland. With his brilliant oratorical skills and his expansive heart pulsating with ahavas Yisroel, he was a true fighter for the honor of Chareidi Jewry in Poland and a true advocate for the downtrodden. He spent much of his time in Warsaw where he had an apartment. From that small apartment revach v ‘hatzalah — salvation and succor for all Polish Jews emanated. During the last years before the out-break of World War II when various terrible decrees were initiated against the Jews such as the decree prohibiting shechitah or the government’s bid to take control over the Chareidi educational system and demand to implement their own curriculum, the gedolei hador such as Rav Chaim Ozer Grodzenski and the Imrei Emes of Ger, consulted with the Reisha Rov seeking his intervention. There are several fascinating halachic teshuvos that the Reisha Rov wrote to the Imrei Emes published before the war in the Reisha Rov’s sefer “Shai los U’Teshuvos Avnei Chefetz”. Not long before World War II, the Reisha Rov was invited by all major segments of the city of Lodz, the second largest city in Poland, to become its Rov. The war broke out before he was formally able to assume the position. During the last horrible years before the war, when the Rov was one of Poland’s most influential rabbonim and shtadlonim who was constantly being called upon to alleviate the plight of his brethren, the Rov was still able to somehow continue penning his chiddushim. In fact, the last four years before the war’s onset were perhaps the most fruitful years of his Torah accomplishments. During those years he prepared the second volume of Teshuvos Avnei Cheifetz (which was never published and was lost during the war). He finished writing his magnum opus on Chumash and Megillos, Hadrash V’haiyun. The fourth volume on sefer Bamidbar was published in 1939. That volume was so large that it had to be split into two. The first portion was published two months before the war while the second half as well as the original manuscripts on Devarim and the Megillos that were fully prepared for publication were lost during the war. With the outbreak of war in Elul, 1939, the final, noble and tragic period of his life began. When the Nazis invaded Poland, Rav Lewin, one of the most well known Rabbinical figures in Poland as well as a member of the Polish Parliament, knew that he was a marked man. In the first days of the war, Rav Lewin, his Rebbetzin and his two younger sons, fled the incoming Nazi troops leaving Reisha for Lvov. It soon became clear that Lvov was also too dangerous so they fled to the village of Kuti not far from the Romanian border. The influential members of the Romanian cities on the other side of the border sent a special emissary to rescue the Rov but the Rov was once again caught at the border and turned away. Meanwhile, the Russians conquered the Eastern part of Poland. Thus the Rov’s life was no longer in immediate danger. He returned to Lvov. The Reisha Rov, however, was fully cognizant of the fact that unless he succeeded in leaving Poland his life was in tremendous danger. He tried crossing the border into Vilna which was at that point had become part of independent Lithuania, but he was caught in the attempt and jailed. Amazingly, the temporary jail on the border was in was in the city of Radin and Rav Lewin was jailed in what had once been the home of the holy Chofetz Chaim. He was soon released from prison but by then, it became known by word of mouth that the famed Reisha Rov was in Radin. The Communist Jews in the city began to watch him and when he again tried to smuggle over the border into Lithuania, he and his wife were caught again. During that period, Rav Lewin’s three sons all managed to escape Nazi occupied Poland. Rav Lewin, however, despite trying a third time to enter Vilna, did not succeed. In July, 1941, the Germans broke their pact with Russia and invaded Eastern Poland. Immediately after the invasion they managed to find Rabbiner Lewin who was on their blacklist. They brought him to jail and, on 6 Tamuz, 1941, Rav Aharon Lewin, the noble gaon, Rov, shtadlan and ohev Yisroel was tortured and killed by the Nazis. On that day, the light of one of Rabbinic Poland’s greatest stars from the pre-churban era was snuffed out… but the light of his Torah that remains with us continues to illuminate the world of Torah Jewry. Primary Source: A chapter on Rav Lewin authored by Dr. Isaac Lewin, son of the Rav, published in, the seminal set of Sefarim Eileh Ezkera.